Direct Santa Fe River Waterfront. 45 min from Ben Hill Griffin Stadium and Harn Museum in Gainesville, FL! 12 min from Ginnie Springs! Centrally located to Cave Diving Country! WIDE OPEN SPACES describes this property. No neighbors peering into YOUR windows here! Three Rivers Inn is a 2500 sq feet 3/2.5 with complete living arrangements upstairs (2/1.5) and downstairs (1/1). Will sleep 10 people in beds. Two kitchens with open entertainment area downstairs, large double carport, & huge oaks (gotta see'em!). Adjacent to the home is a 5 acre homeowners park with pavilion, volleyball, horseshoes, boat ramp and freshwater spring. This is a non smoking home, smoking allowed on the decks outside. Bill and Sharon Jones are the proud owners of this wonderful property. Bill was born and raised on this river system. Bills family has owned property on the Ichetucknee and Santa Fe continuously since 1958. When Bill graduated from college in 1982 he bought property himself and have been the proud owners of Three Rivers Inn at Ira Bea's Oasis since 1989. When Sharon came along in 1996 we raised our children at our "vacation home" eventually moving there in 2009. We spent 4 years there and when the kids became heavily involved in high school sports the family moved to Lake City. There are FEW that know this river system as well. The area is all about relaxing, water, diving and tranquility. We ENCOURAGE you to ask any questions you may have! Upstairs upscale with flat screens, dishwasher, wood floors, quality throughout. Downstairs open floor plan, indoor/outdoor carpet, TV, kitchen, nicely appointed. 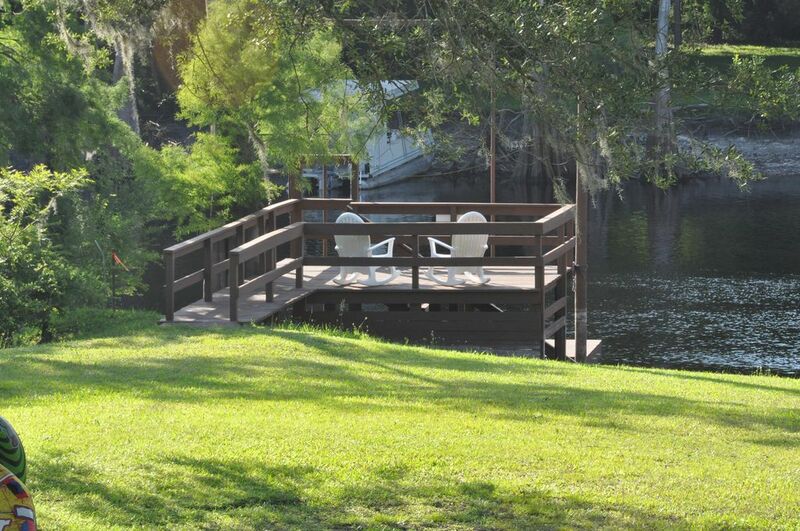 Large decks (up and down) overlooking river and lagoon. 800 sq foot multi level floating dock in the river. Satellite TV and high speed internet available. You won't find a nicer place! Great time on the river. We really enjoyed our stay at Three Rivers Inn. There was plenty of room for our group of 9. We had a great time boating on the Santa Fe and visiting near by springs. Thank you for your review. We are so glad you had a great vacation and were able to enjoy the river and the beautiful springs. We would love to have you stay at Three Rivers Inn anytime!! The home provided all the space we needed. The only difficulty was finding the property. We arrived around 7:00 pm and it was pitch black. There were no lights on and the address was on the corner of the house which can not be seen from the road. We used our GPS which got us there. I would recommend leaving a light on outside where you can see the address. Thank you for the review. We were there until 3 pm preparing for your arrival and I did not turn on the light. My apologies. Yes it can easily be found by GPS. We did contact you three weeks prior to let you know that the water was high and that you would have limited access to the dock. We did that to prepare you and address concerns you might have. You were good with it. Sorry about the rain. Its unfortunate it rained as most find the high water IDEAL for using the canoes and kayaks as the river slows significantly and there is abundant easy paddling. Sounds as if it was a 3 star weekend due to the conditions. I recommend a fall weekend in late October or November when the air is crisp, little rain and the leaves are gorgeous. Call me....you won't be disappointed. I highly recommending for people who like to be far away from the city,beautiful nature !!!!! Very well kept, A delight ! Hi this is Sheryl's husband Tony. Six of us adults went and had enough room for four more. Very spacious and comfortable.The two kitchens (one up and down stairs) was a plus. The freshly cut yard all the way to the river was nice. Although we did not use, the canoes and kayaks were nice. I am an Atl Braves lover, so having the channels was awesome. Can't say enough about the river, absolutely beautiful ! I will let you know there is a board under carpet on balcony and top step of dock that needs replacing. Thnx and hope to be back asap ! Thank you for the great review! We will be taking care of the boards on the dock and balcony as soon as possible. the house looking wonderful. We hope you'll come back to stay again! This is a beautiful property and the house slept all 9 of us comfortably with a bed to spare. Hope to come back! We had so much fun! Very peaceful, water is amazing, yard is perfect, house was so comfortable. Thank you so much for allowing us to spend our vacation here! is also only minutes away by car or boat. Rails to trails is also a short distance away. Peak Season (Apr-Sep) $1421.05 per week $245 per night Friday, Saturday and holidays $195 per night Sunday - Thursday 2 night minimum 3 night minimum Memorial Day, Fourth of July & Labor Day Off Season (Updated Rates Coming Soon) $1500 per week $260 per night Friday, Saturday and holidays $200 per night Sunday - Thursday 2 night minimum Monthly rentals available during off season. Contact Monica for rates.